Challenge Cards each contain a specific series of modifiers that players may choose to activate, to modify the Nightfall difficulty and their overall Nightfall score. 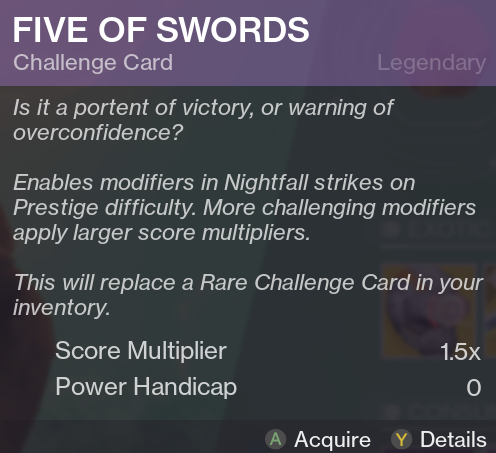 Note that Challenge Cards are set by the Fireteam leader and only affect the Prestige Nightfall Strike. Challenge Cards do not modify the Normal Nightfall Strike. PLEASE NOTE: Destiny 2: Curse of Osiris players who do not own Destiny 2: Warmind and have the rare-quality Challenge Card will not be granted access to the Prestige Nightfall. Players who wish to engage in the Prestige Nightfall activity will need to own Destiny 2: Warmind. Players who complete each featured Nightfall Strike will be awarded that strike’s Nightfall Emblem. This emblem will track a player’s highest score achieved for that Strike, and upon completing a Prestige Nightfall Strike with a qualifying score, offers players the Nightfall Aura for a limited time. Players may also unlock variants of these emblems by achieving high scores in the Prestige Nightfall.